I prefer old houses to new, but this house has an old-fashioned feel and is on acreage in the hills. If I were looking, this would be waaaaay out of my price range, but a girl can dream! I'm on a big Cape Cod kick right now, so this house is currently on my "heavy rotation list." Interestingly, I'm not sure this is vintage...there's just something about it that seems newer (1970's?). Opinons? At the more humble end of the spectrum is this cutie in town. It's just a tiny little bungalow, but it has the most adorable collection of shingles, and that diamond window is too cute. Simple but charming. Another Cape Cod, this one on a street full of cute houses with gorgeous summer gardens. Love that sunroom to the left. And the brick steps and walkway are so cute! This house is small and simple, yet has a lovely elegance and welcoming feel. I think it's partly the colors: the sage green, white and dark blue/black. And I adore weeping birches. Definitely my favorite tree. Overflowing cottage style gardens always catch my attention, no matter what the house is like. This old house is charming, of course, but the garden! Picket fence, vines, roses...what more could you ask for? Another picture from last summer, this is also another Cape Cod. 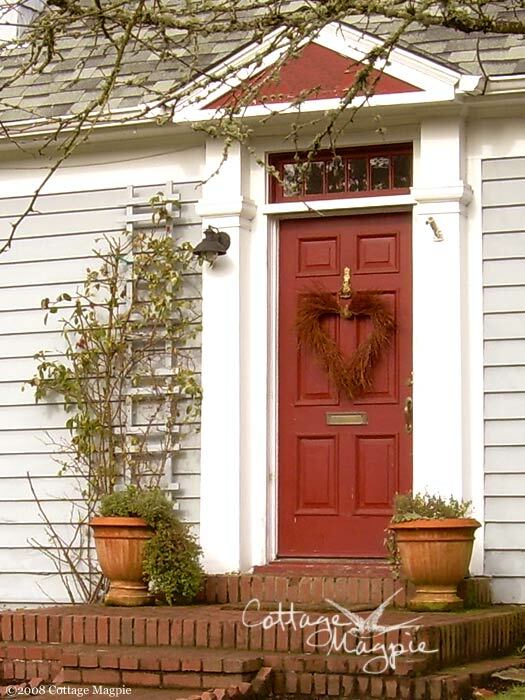 I love neat iron hardware on the front door and the charming shady garden. I can just imagine it as a cool retreat on a hot summer day. What about you? What houses do you drive by? If you post any on your blog, make sure you leave a note on Jennifer's post. If you haven't already discovered The Old Painted Cottage, you are in for a treat! Jennifer's blog, site and "Cottage of the Month" feature will give you hours and hours of eye candy that you don't want to miss! Update: I've also since found out that the very genius talent Melissa at The Inspired Room had also posted about this previously, including some gorgeous photos of houses in the best of best neighborhoods in Portland, Oregon. Make sure you visit her post, too!